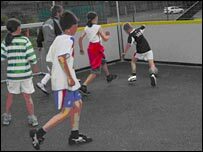 In this week's reader's article, John McGlashan, from Arbroath, says street football is an innovative weapon in tackling anti-social behaviour and other social problems like childhood obesity. Anti-social Behaviour, Child Obesity - Is there anything we can do? Well, actually there is. A charity in Arbroath, The C.A.F.E. Project has started a social revolution. Our pioneering 'Street Football and Games For All' program promotes socially acceptable behaviour by involvement in sport in a safe and structured manner. In particular we encourage the development of interpersonal skills including interaction, co-operation, negotiation and compromise. Several times a week we go into areas where few facilities exist with our two portable, enclosed pitches surrounded by high netting and offer the young people two hours of strenuous fun that costs them absolutely nothing. Football, basketball and hockey are just some of the street games we put on. We offer a safe, controlled environment where young people of both sexes and all ages mix with each other under the supervision of qualified coaches and trained volunteers. Over the last 12 months we have attracted over 3,000 young people to our events, one in five of them female. What makes this programme unique are not only our mobile pitches but also our special 'Fair Play Rules'. The young people agree them at the start - no violence, no elbowing, no bad language, agreement on penalties (there's nae ref!) - and at the end of each game the young people agree the points to be awarded or deducted for good or bad sportsmanship. That means that the team that scores more goals can get 'beat' by the team that plays more fairly. We also encourage them to take the lead in picking teams, timing the games, recording the scores and even helping assemble and dismantle the pitches. In consultation with the police we concentrate our resources and efforts by going into 'hot spots' where anti-social behaviour is most acute. The result? Anti-social behaviour incidents and nuisance calls recorded by Tayside Police are reduced by up to 50% when we're out-and-about. All it needs is a mobile pitch and trailer, a small staff, a relatively small budget, dedicated volunteers and loads of young people - it's as simple as that and it works. We are giving these young people a chance to do something positive with their free time and significantly reducing anti-social behaviour, drug and alcohol problems and promoting health in the process. We're spreading the idea around Scotland and further afield.